Web 2.0 and the programmable web that I and others have been talking about for a while has mostly been vapourware so far. There are a few generic components that are useful, but it is somewhat limited what you can do with them. And yes, you may consider this a somewhat biased view, but I think Yahoo!’s new geocoding platform is a huge step in the right direction. 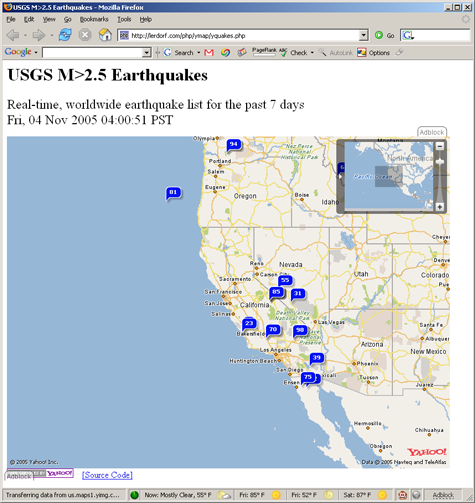 Geocoding is the hook that could get the Yahoo! Maps API more popularity. Rasmus has a great tutorial written on how to create a map with Y!Map API and PHP. He even shows you how to use the Flash or AJAX front end. I’m amazed at how easy it is to use and Rasmus even has a demo showing all the earthquakes (what else would a California programmer do) that have occurred over the past 7 days.